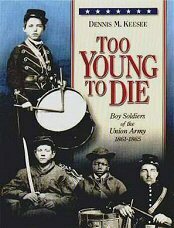 Dedicated to underage American soldiers, hosted by Dennis M. Keesee, author of Too Young To Die: Boy Soldiers of the Union Army 1861-1865. If you are a veteran who served at 17 years or younger please share your history here! In 2002 Dennis was honored to be invited by Evelyn Brouse as the guest speaker at the American Veterans that Enlisted Underage (AVTEU) annual reunion in Peoria, Illinois. It was a wonderful experience where we met many interesting vets who served. If you would like to know more about this organization go to the contacts page. If you know of a family member or friend that served, please tell them of our mission to gather stories of those that served underage. For over 20 years Dennis has collected information on our country's boy soldiers. Following TYTD's 2001 release, Dennis has traveled extensively speaking about TYTD and its boys. Please visit our About the Author page If you are interested in having Dennis speak to your organization. Click on the small book icon above for information surrounding Dennis Keesee's book Too Young To Die including reviews, "The Rest of the Story," past events, authors' commentary and more. Don't pass up visiting this section if you are a collector. We hope to continuously add items of interest as time allows. If there is something you are looking for, let us know as well. This is not our full time avocation but something we have fun doing. You might be surprised with what you may find. As we want you to leave with a little bit of our personalities we will be sharing photos of our family and friends, as well as interesting tidbits from time to time. We want this to be an educational as well as entertaining site. Please let us know if you have any ideas to help improve the site. 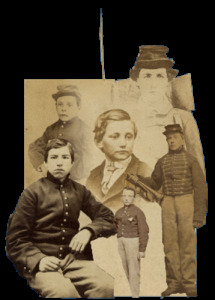 Dennis M. Keesee, author of Too Young To Die: Boy Soldiers of the Union Army 1861-1865.